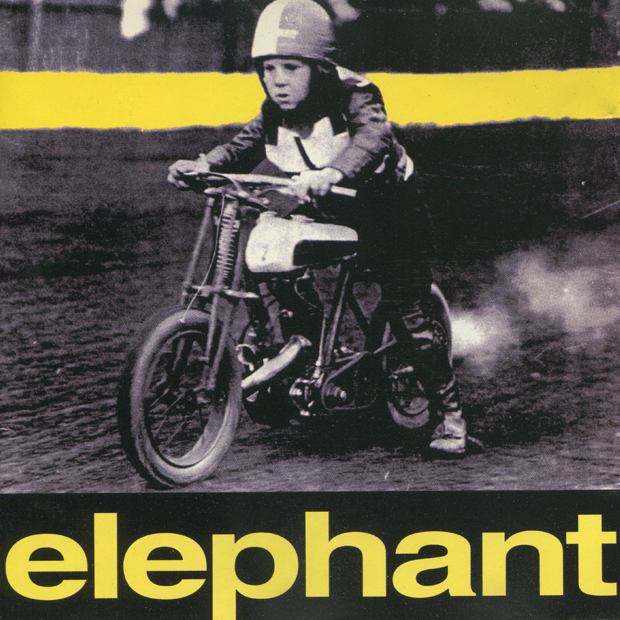 —Superbike train: Jaco Gous, Johan Le Roux, Michael Smit, Stuart Russell, Sid Farinha, Raymond Keel. 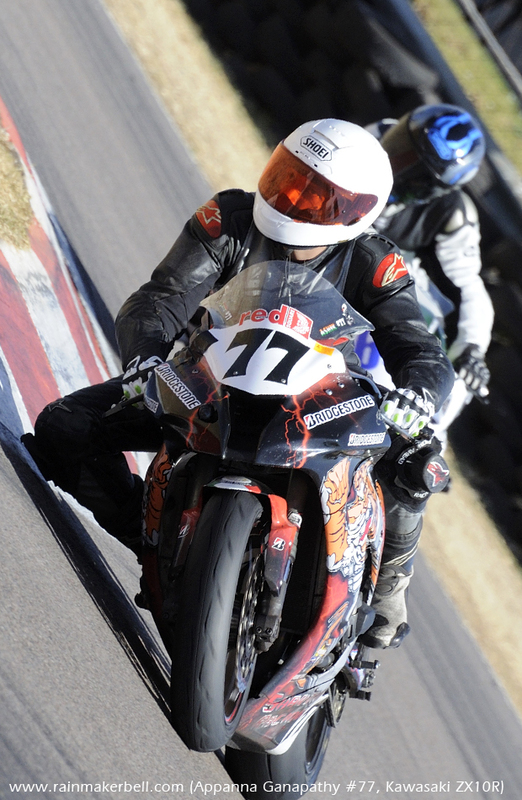 It is late Wednesday afternoon; seven more days before the thunder returns to Zwartkops Raceway. I try my finest to write something for the Red Square Kawasaki ZX10R Masters, but my dear mind struggles to see the light in the vastness of its own dark expanse. This happens from time to time: the emptiness. The only solution I can think of right now: a sixer of Grabbie’s Cloudy Alcoholic Ginger Beer. It tastes absolute fantastic, very refreshing, served of course—iced cold. Desperate times calls for desperate measures. —For the ill-informed: Grabbie’s and Red Square share the same Halewood International product mix, and, both are spirit coolers. 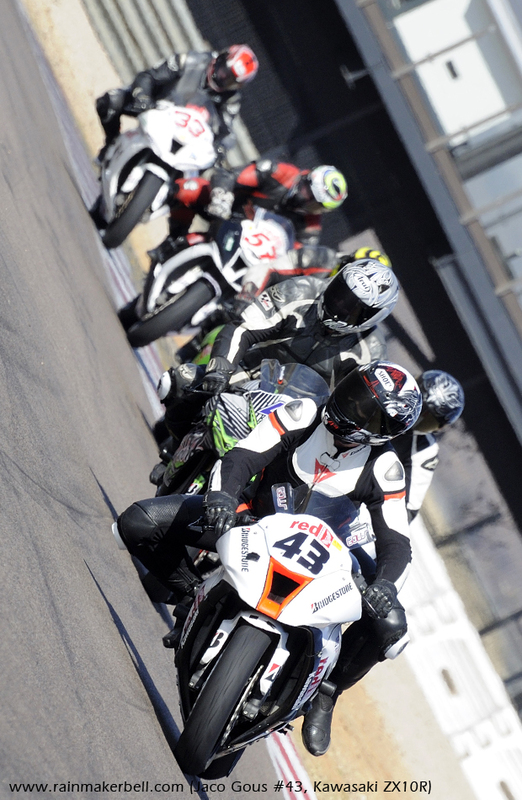 Red Square is also the main/title sponsor of the Red Square Kawasaki ZX10R Masters Cup. Braai Day, 24 September is just around the corner. Although most South Africans prefer to call the day: Braai Day (or National Braai Day); it is actually Heritage Day. 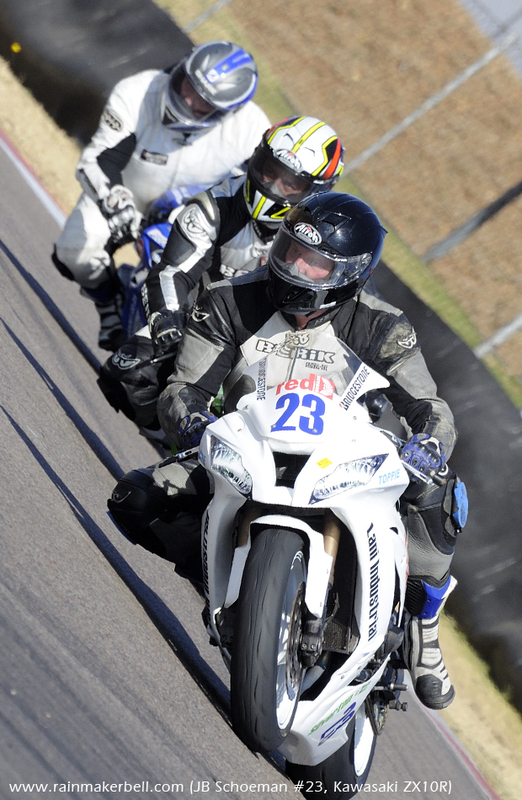 Super thunder awaits the thousands who will be descending on Zwartkops for the third last round of the Red Square Kawasaki ZX10R Master Cup/the Extreme—motorsport—Festival. 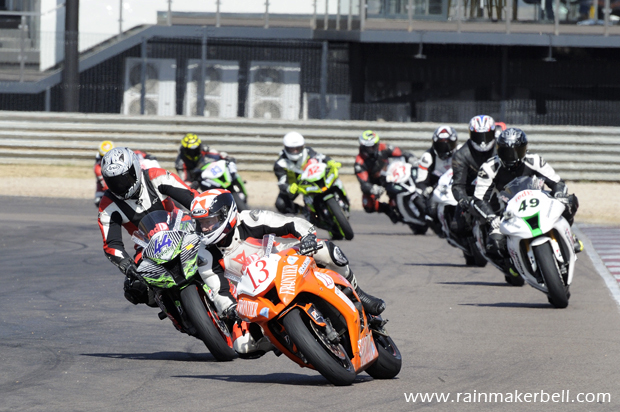 To keep spectator attention glued to the track, the organisers will also throw in: Thunderbikes (1000cc + 600cc), Silverton Bolt & Nut Brunch Run Challenge, Extreme Supercars—this is a must see; the VW Challenge, BMW Car Club Racing, etc. With ten different motorsport categories, I can’t see why you should stay at home. Pack the suntan-lotion, earplugs (you gonna need it), braai, charcoal, camping chairs, pre-loaded cooler box, mix, chops, steak, wors, sunglasses, gazebo ... What did I forget? OH! The wife, girlfriend? If you are in the vicinity of the Red Square Kawasaki garage on Thursday (you definitely can’t miss it), come say hello; come meet the Masters, take a few selfies; insatiable Facebook needs your invaluable posts, dearly! Mark (Weitz) might even score you a freebee out of his icy coolers (I said, might). Now, with everything in tune, and the calmness encapsulating their true egos, they impatiently wait for the red lights to drop. With 24 Kawasaki superbikes on the grid, you will be astounded out of your skull. 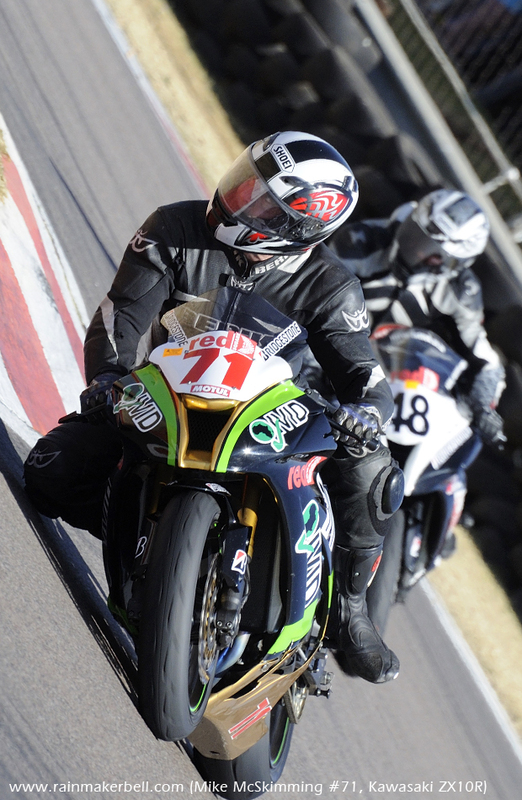 —For a foretaste of what awaits you on Thursday, come see the Red Square Kawasaki ZX10R Masters is action, on Wednesday, 23 September, at the illustrious Zwartkops Raceway. Remember—it’s FREE. A full motorsport practice programme is scheduled for the entire day. After the sun has fallen off the horizon right next to Zwartkops Raceway, the Aces Café will come alive with the animated spirits of the ZX10 Masters; washing away the heat, sweat and dust, with a few Red Square spirit coolers (what colour is your Red Square?). Concluding the day as one of the best superbike outfits in the country. I look forward to this (National) Braai Day! If you page trough old family photo albums (dated before February 4, 2004), nowadays Facebook (my sarcastic definition of it: ‘the lonely lives of sedentary hypocrites.’), you will come across stupid hairstyles (for some it never changed), dull attire, cars with wheel caps, and bikes (motorcycles) with the aerodynamics of a garage door ... SMILE. Then only, will you realise how the times have fast forwarded, how old you have become. Time waits for no man. To be a true Master, except from the obvious: pulling the scale at 35 plus; you must be able to race a Kawasaki ZX10R superbike full throttle, negotiating the thunder through some for the toughest racetrack turns in South Africa. Oh, and before I forget: you must be super fit and definitely agile. If you would like to become a 2016 member, please contact Lynette Fourie at: 012 804 1974. This is one of the BEST motorcycle clubs in South Africa—backed in full by RED SQUARE. 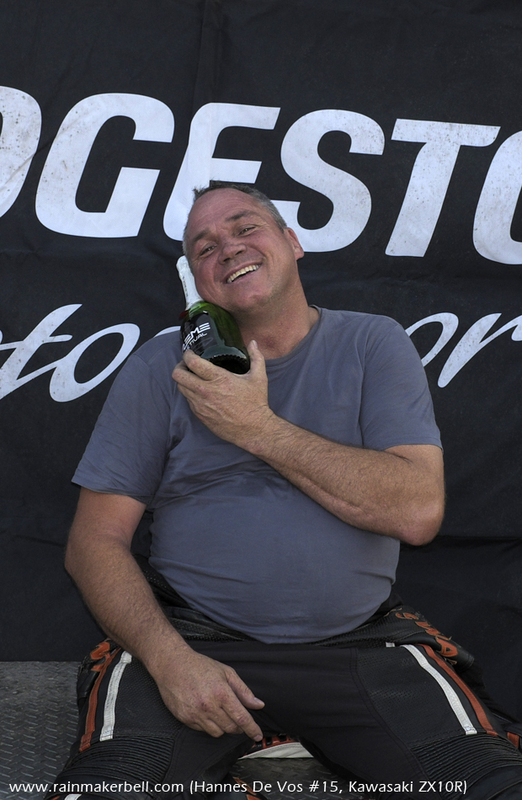 The Zwartkops starting grid spewed out the following fearless entries, (this racetrack is no easy feat when it comes to superbike action; on a lighter side however, Stewart MacLeod still holds the track record: 01:03.791.) nemesis Graeme van Breda (with 280 points), Pieter "the Terrier" De Vos (231), Kyle Robinson (189), Tony Klem (168). Will Klem be able to even, or better his second place podium of the previous race meeting, or was it just a fluke? Let me think ... Thirteen is coming down the black pipe—with a force! Raymond Keel #33 (98), André Denoon #58 (96). It is with sadness that we wave our good friend and fellow rider goodbye. Let’s play out with Vangelis: https://goo.gl/Un9uB5. Stuart Russell #83, in seventh place, with 96, and on the Broccoli Brinjal Kawasaki ZX10R, it is Johan Le Roux #44, in eighth. In their wake is: Stewart Christie, Peter Clark, Hannes De Vos, Hennie Du Plessis, Sid Farinha, Appanna Ganapathy, Jaco Gous, Ian Harwood, Allen McGuire, Abrie Marais, Rodney McLachlan, Mike McSkimming, JB Schoeman, Henk Schuiling, Hano Van Der Merwe and Michael Smit. 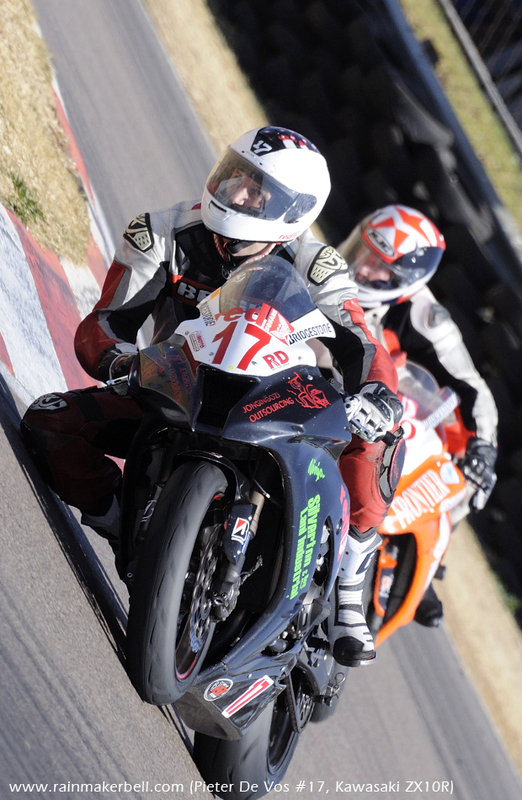 © 2015 www.rainmakerbell.com - Prequel 2 Sequel - Red Square Kawasaki ZX10R Masters, Zwartkops Raceway, South African Motorsport, 2015/09/20.